Triathlete racing for a higher Purpose! 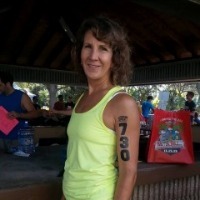 "On November 11, I will be competing in my biggest personal challenge so far, Ironman 70.3 triathlon. Rich has been with me every step of the way not only as my coach, but also as my inspiration of the true meaning of commitment. His dedication to his son's condition, nemaline myopathy, drives me to give my best each day. In thanks for his support, I am asking you to help me give back by donating to GoLukeFoundation to help children with muscular disabilities to thrive.". Please considered a donation and sharing this page with your friends and family!